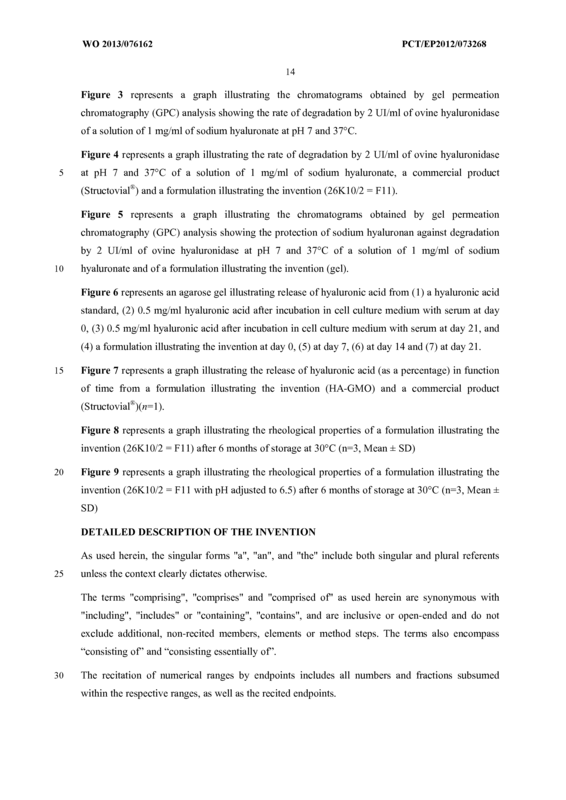 The invention relates to a gel-forming formulation comprising a glycosaminoglycan and a monoglyceride. 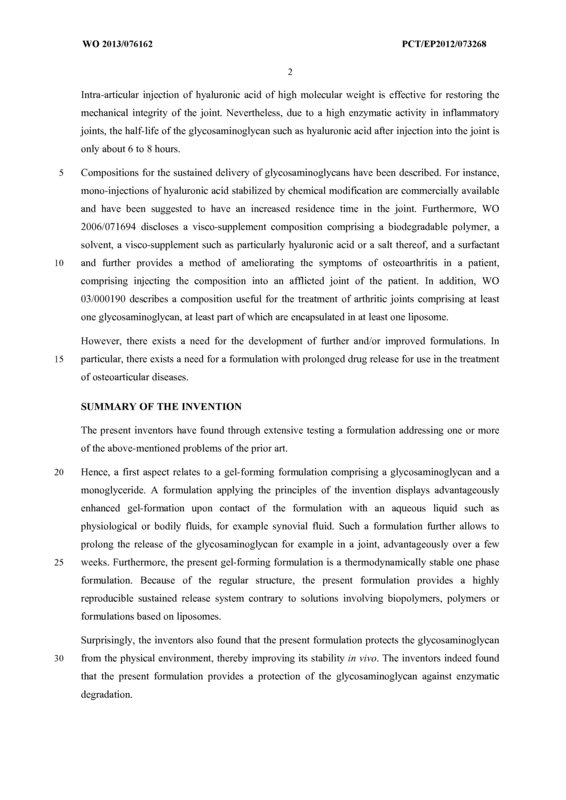 The invention also relates to a medical device comprising the gel-forming formulation and to the gel-forming formulation for use as a medicament, preferably for use in the treatment and/or prevention of osteoarticular diseases. 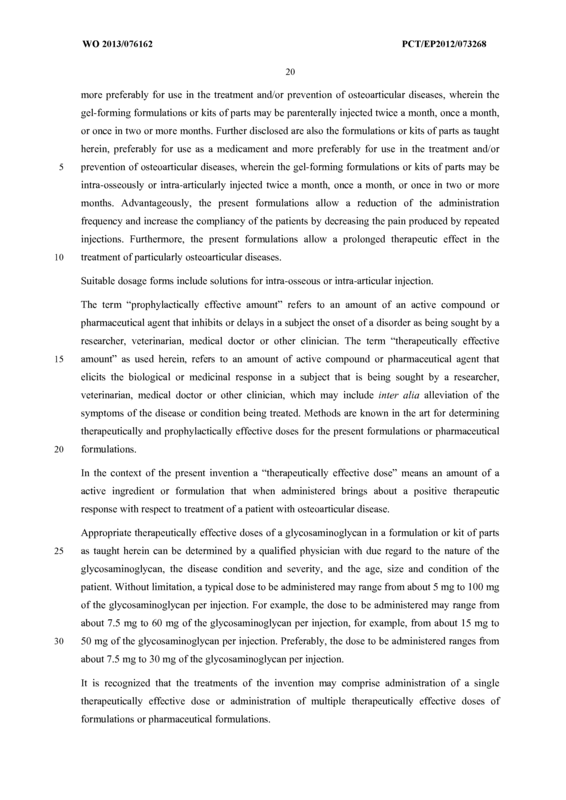 The gel-forming formulation may be suitably delivered by parenteral injection, preferably by intra-osseous or intra-articular injection. 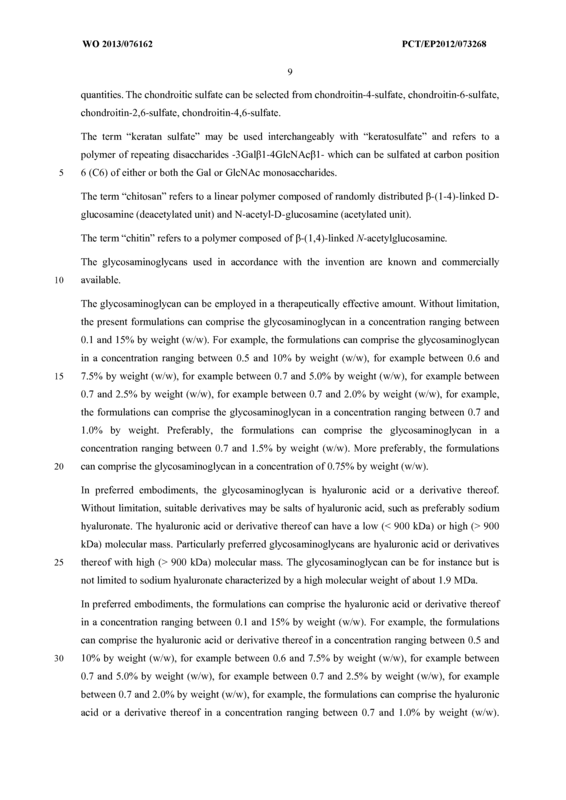 A gel-forming formulation comprising a glycosaminoglycan and a monoglyceride. 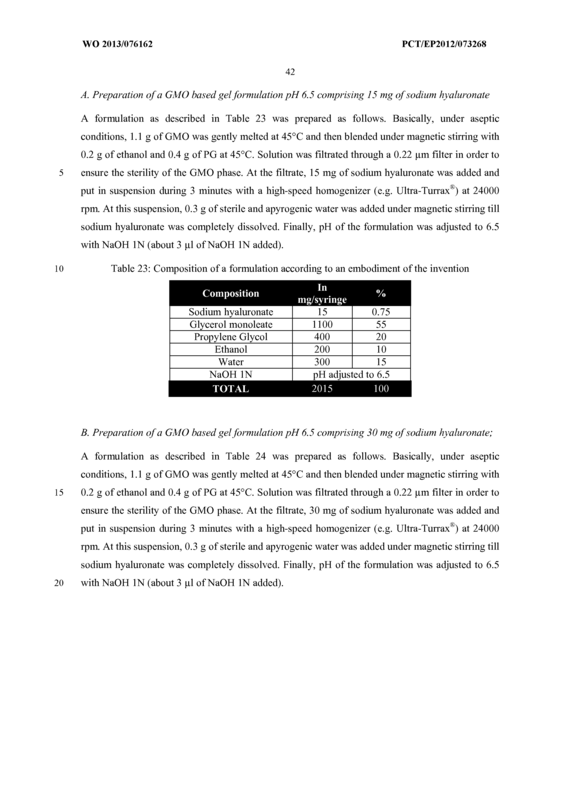 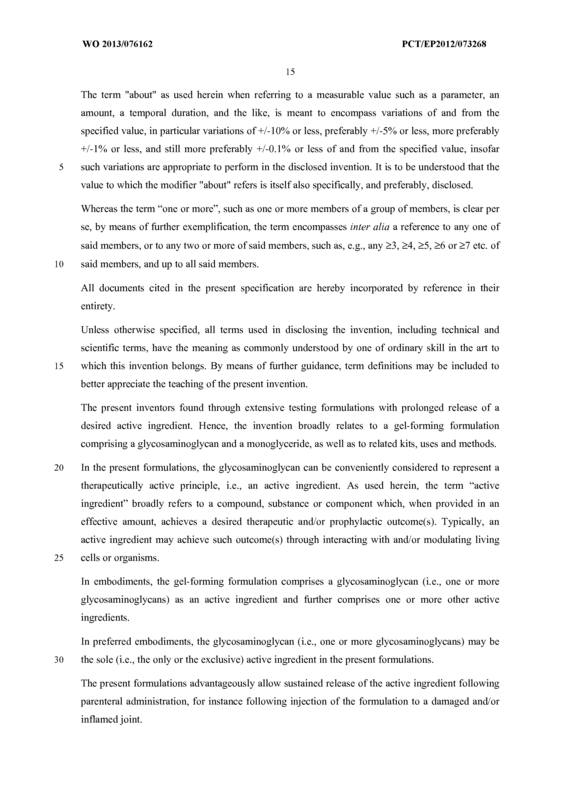 The gel- forming formulation according to claim 1, wherein the gel- forming formulation is not liposome-based. 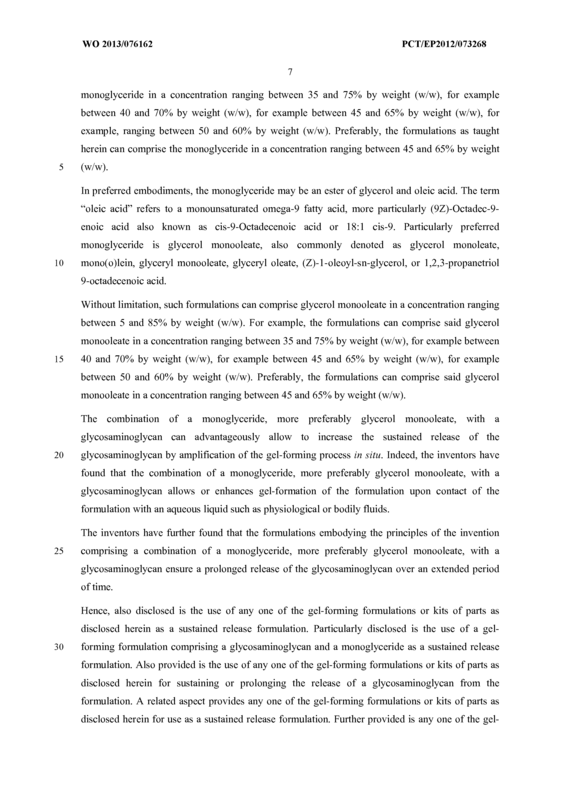 The gel- forming formulation according to any one of claims 1 or 2, wherein the gel- forming formulation is configured for parenteral administration, preferably for intra-osseous or intraarticular administration. 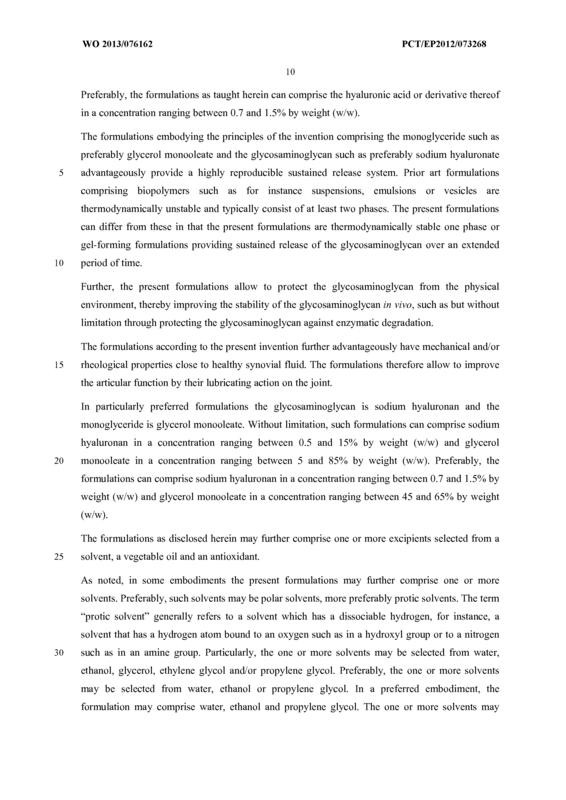 The gel-forming formulation according any one of claims 1 to 3, wherein the monoglyceride is glycerol monooleate. 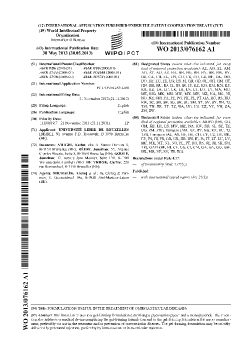 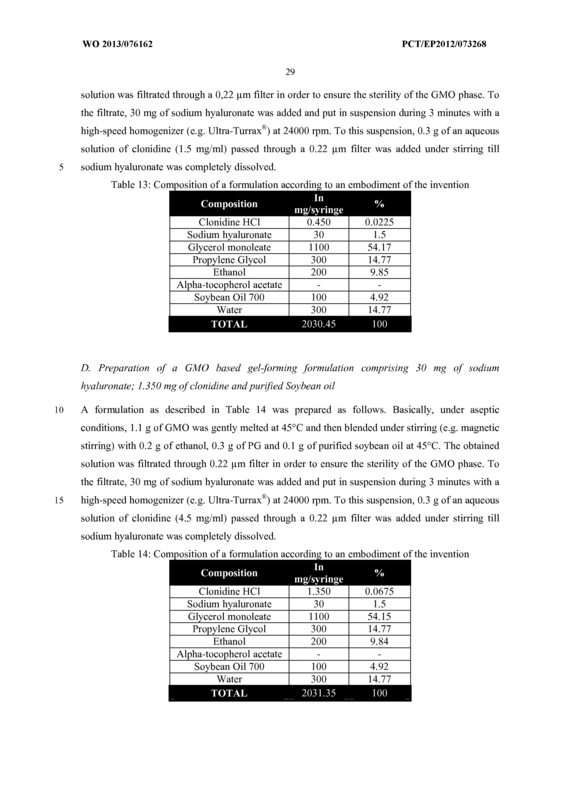 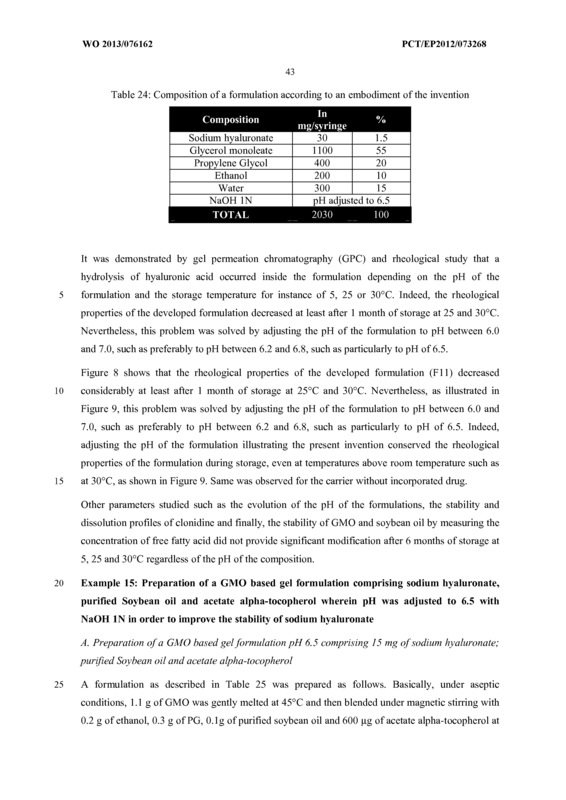 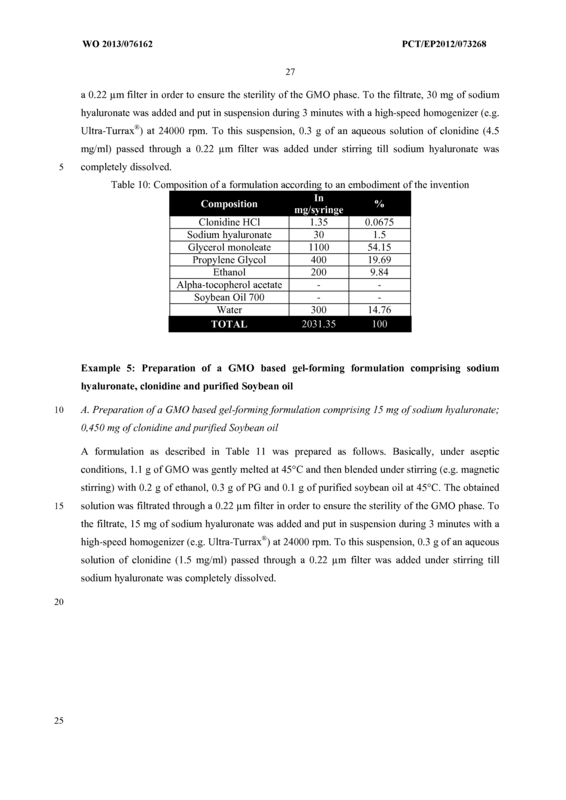 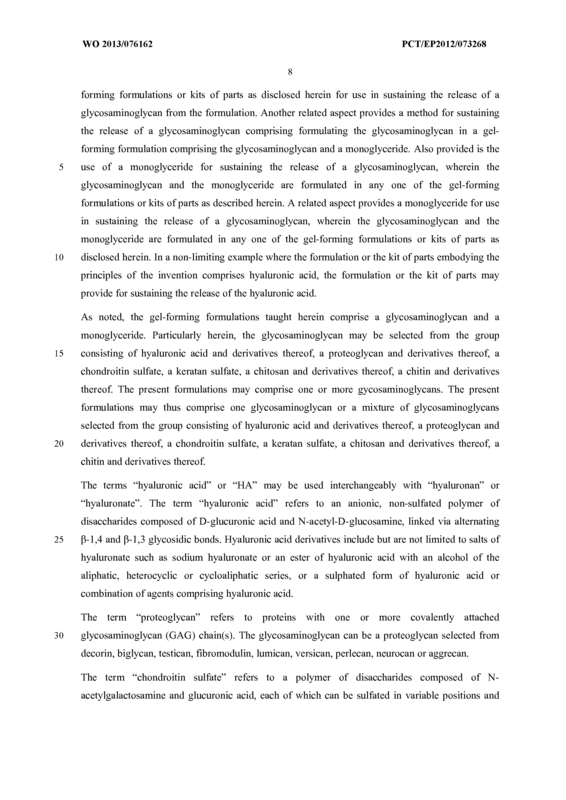 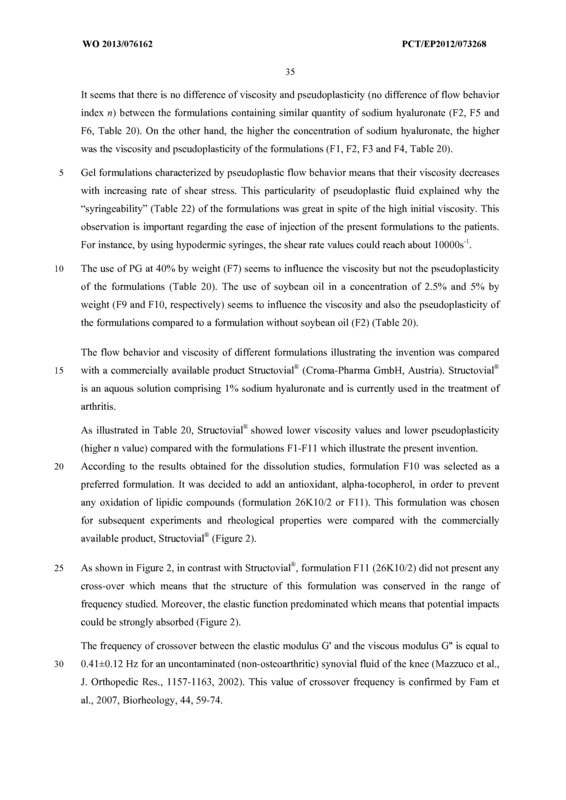 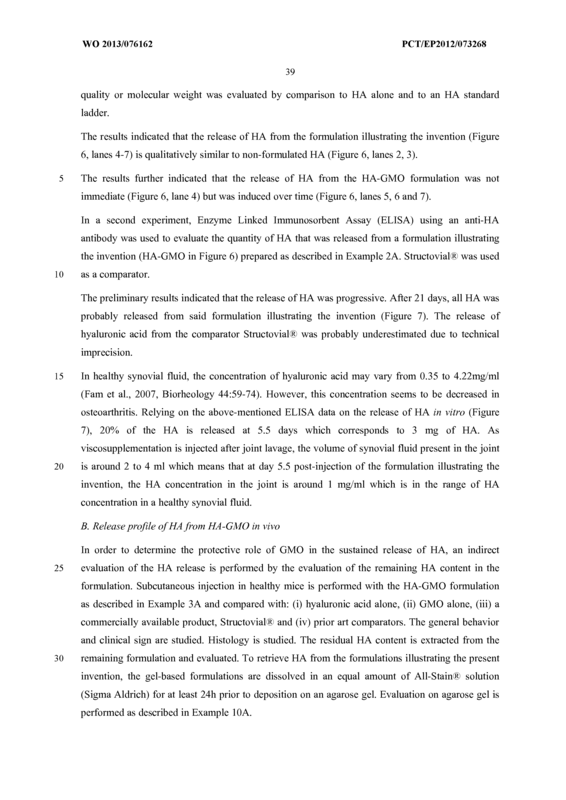 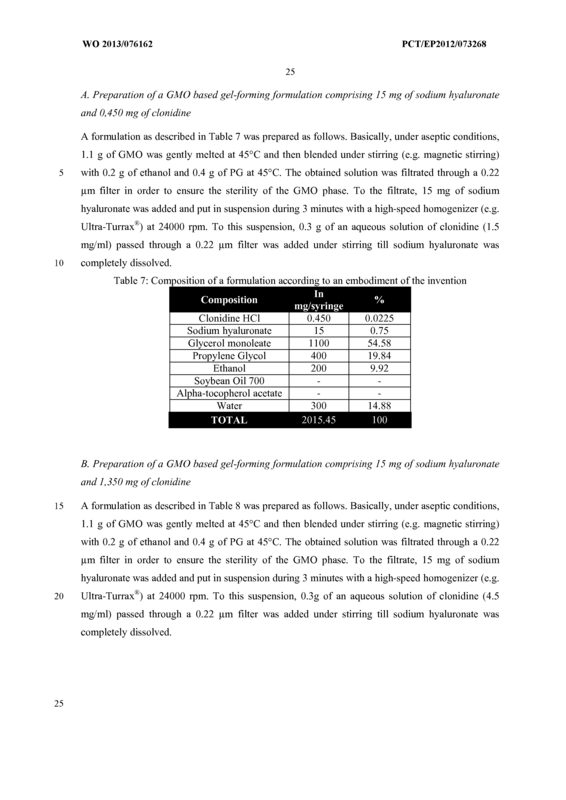 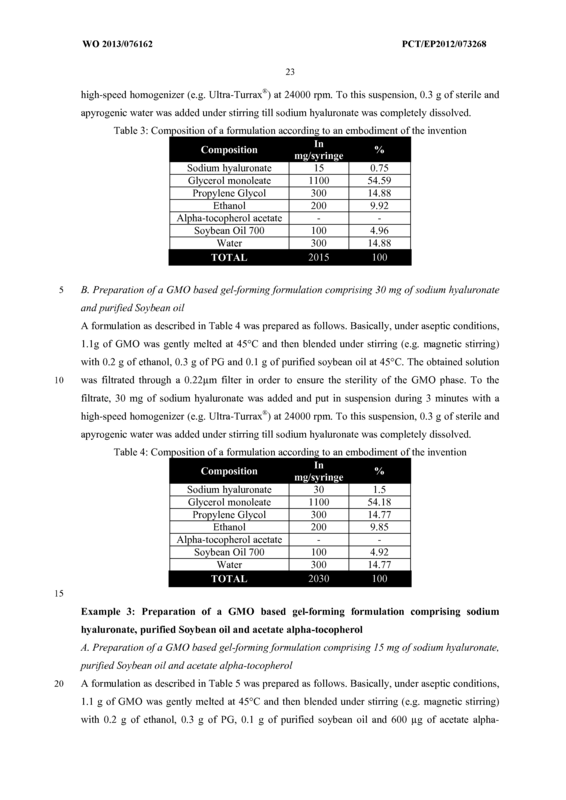 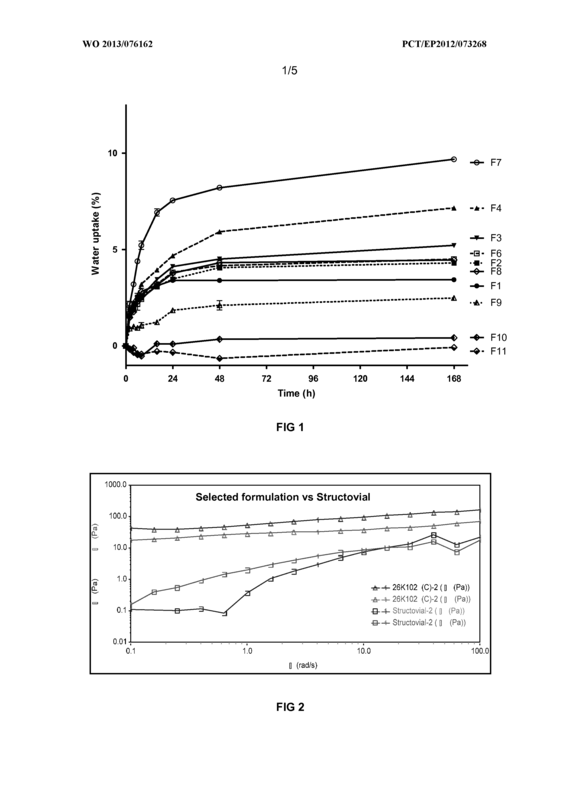 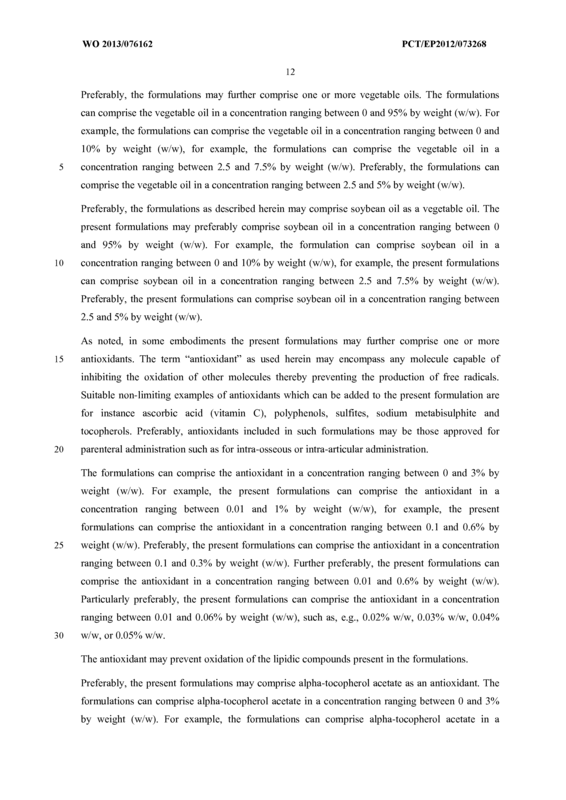 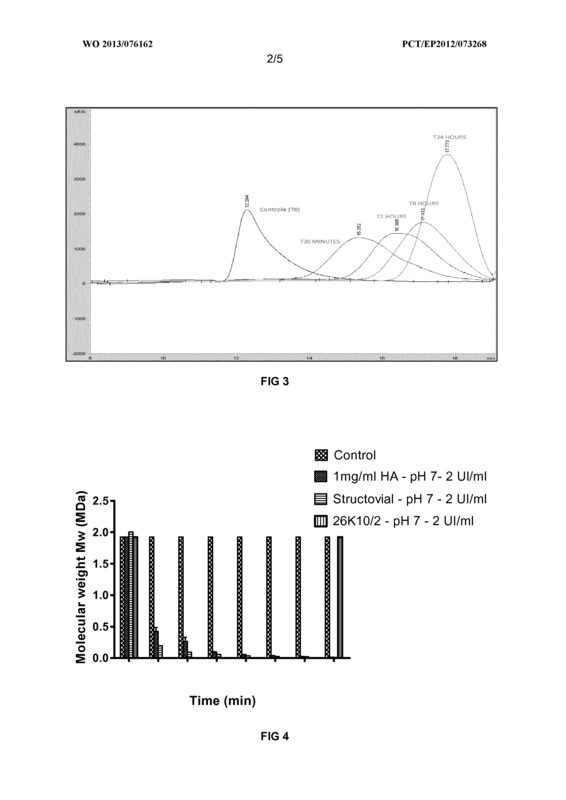 The gel-forming formulation according to any one of claims 1 to 4, wherein the glycosaminoglycan is selected from the group consisting of hyaluronic acid and derivatives thereof, a proteoglycan and derivatives thereof, a chondroitin sulfate, a keratan sulfate, a chitosan and derivatives thereof, and a chitin and derivatives thereof. 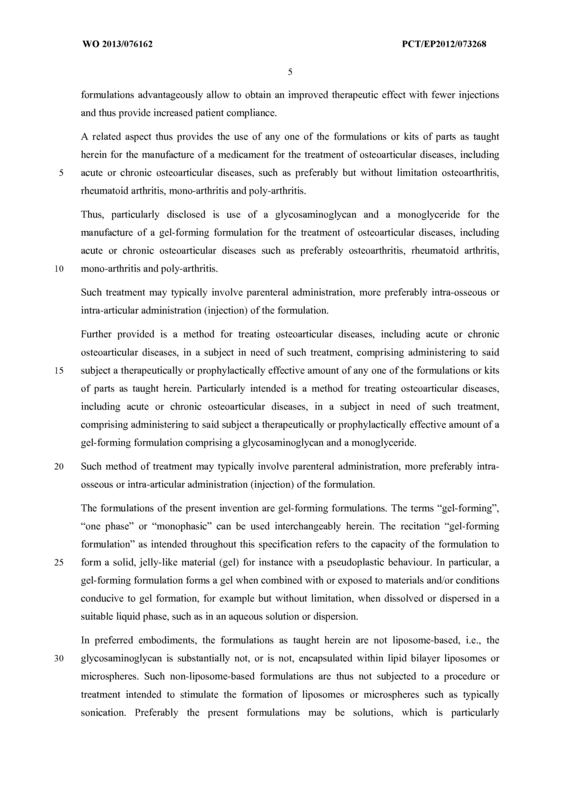 The gel-forming formulation according to any one of claims 1 to 5, wherein the glycosaminoglycan is hyaluronic acid or a derivative thereof. 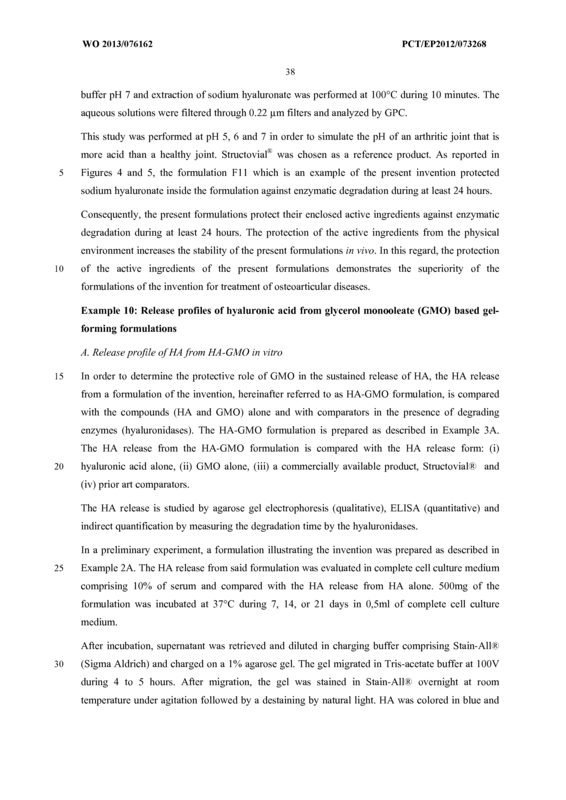 The gel-forming formulation according to any one of claims 1 to 6, wherein the glycosaminoglycan is sodium hyaluronan and the monoglyceride is glycerol monooleate. 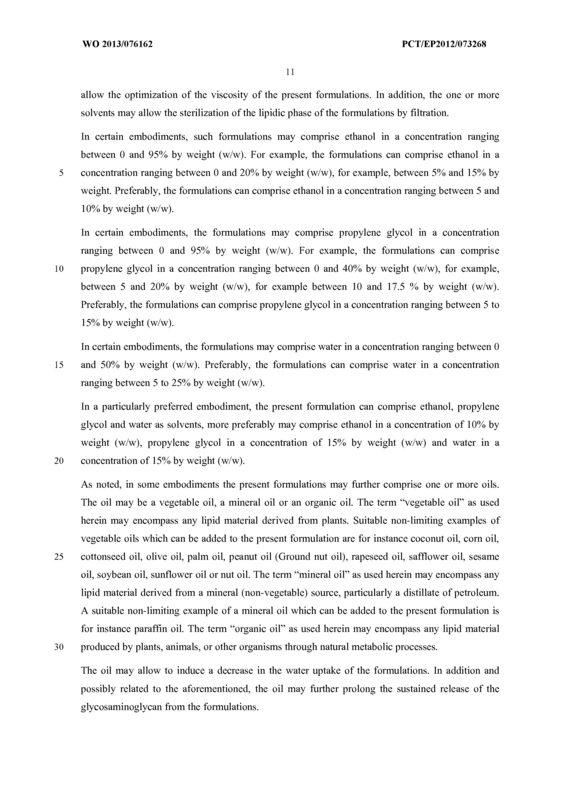 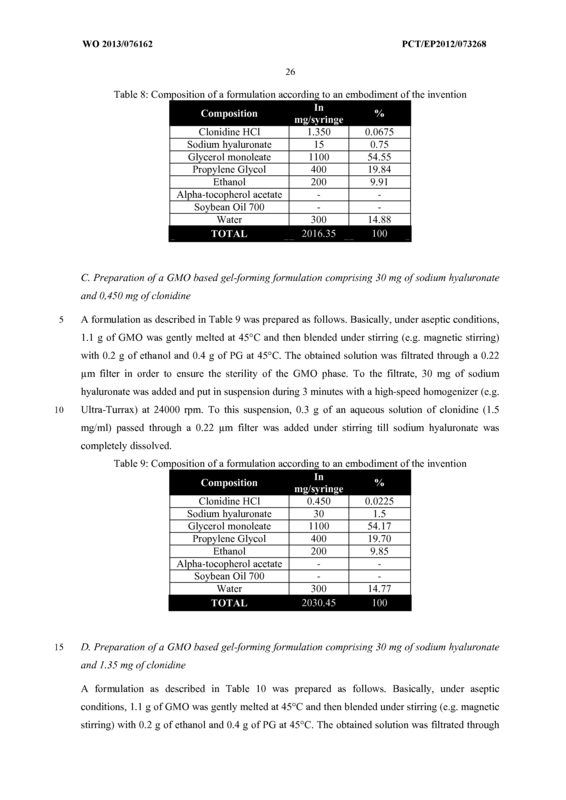 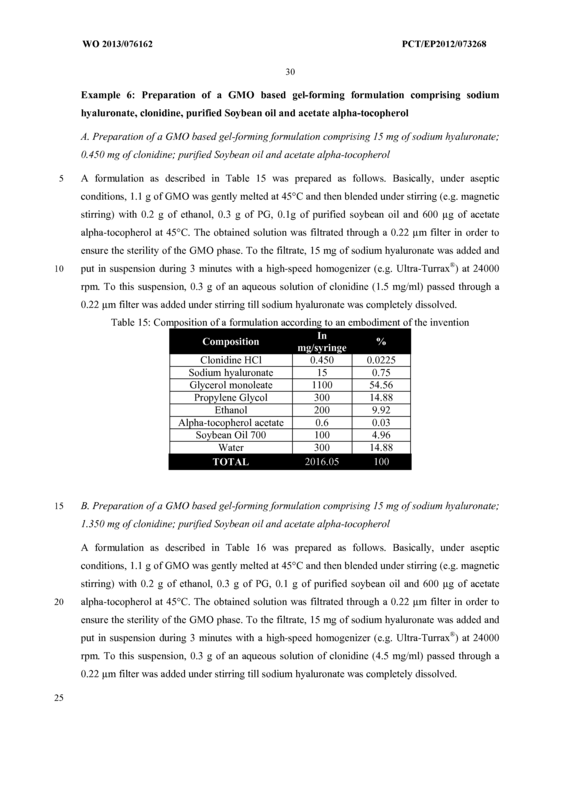 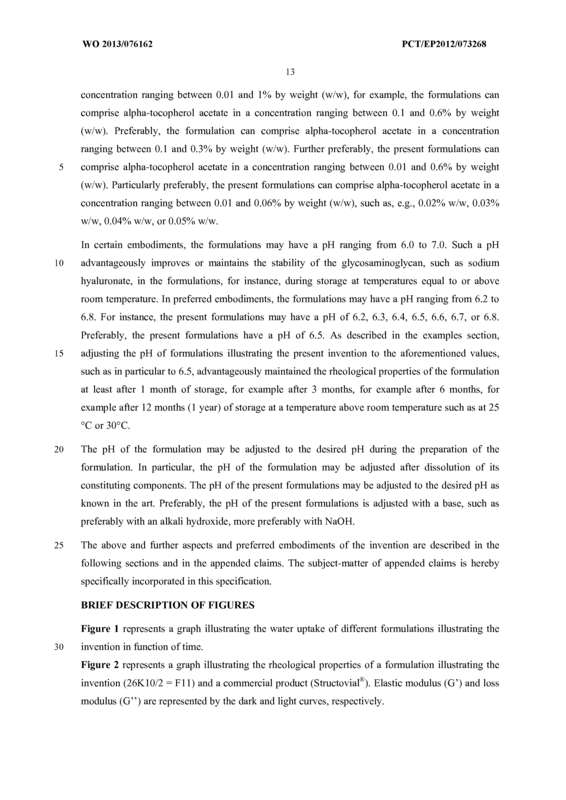 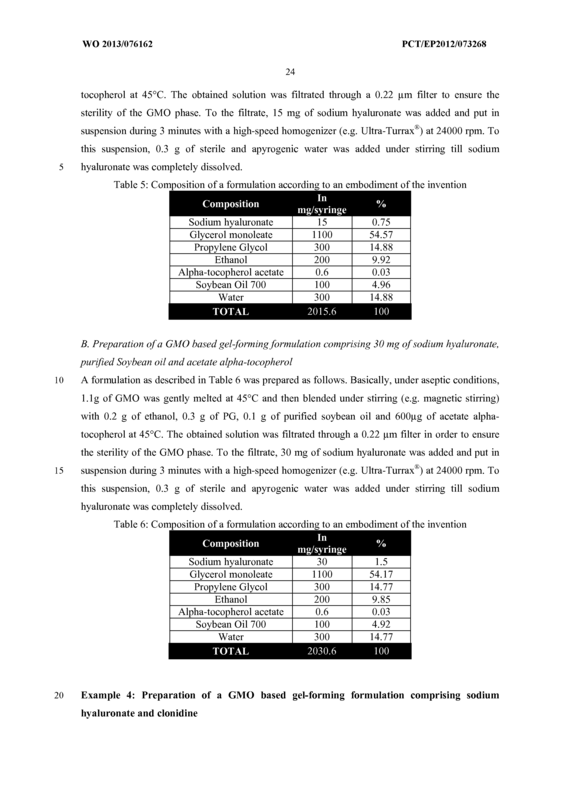 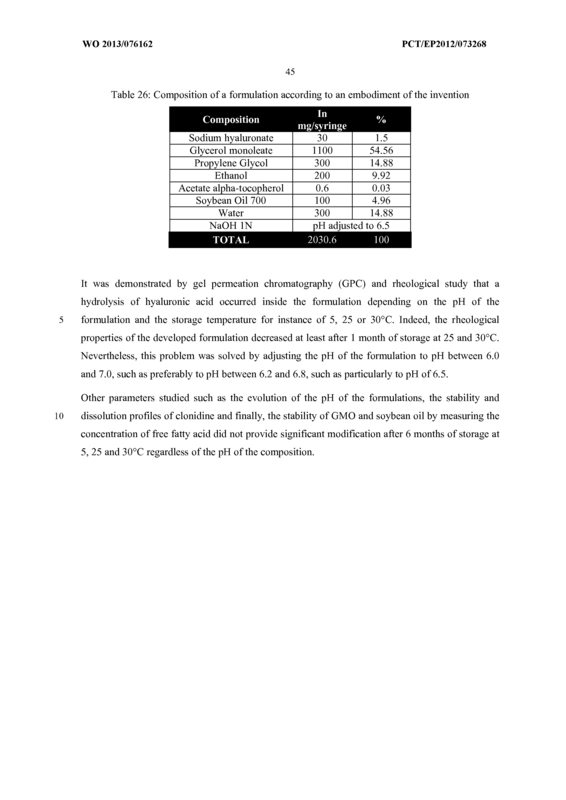 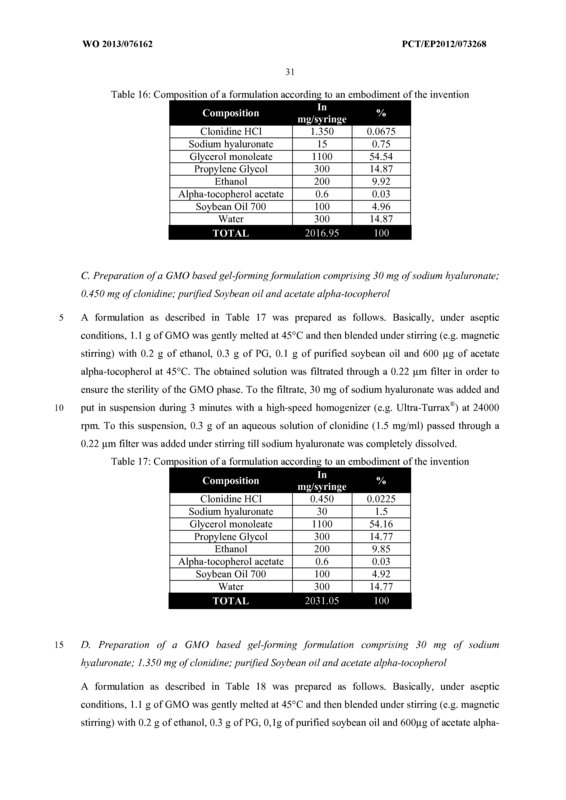 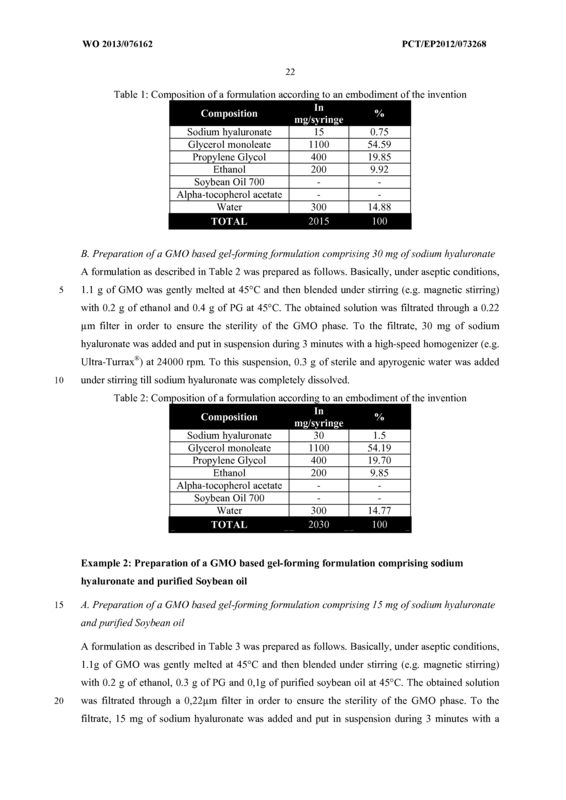 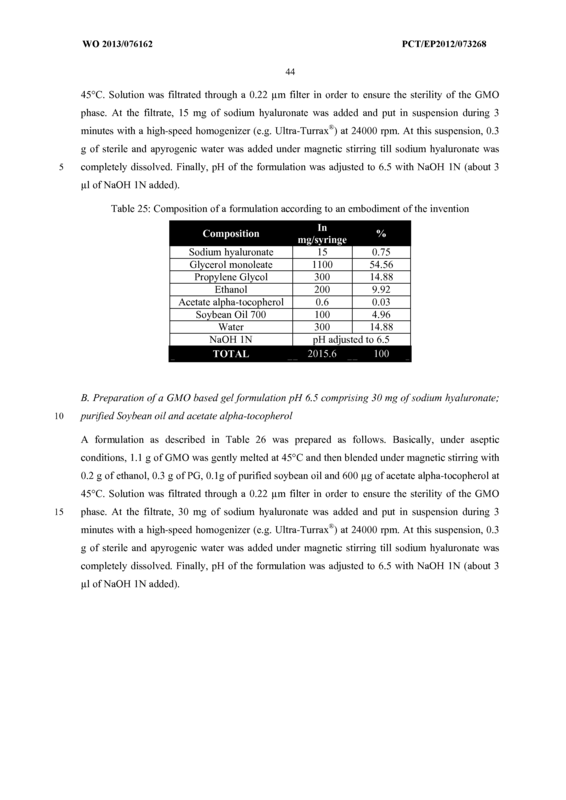 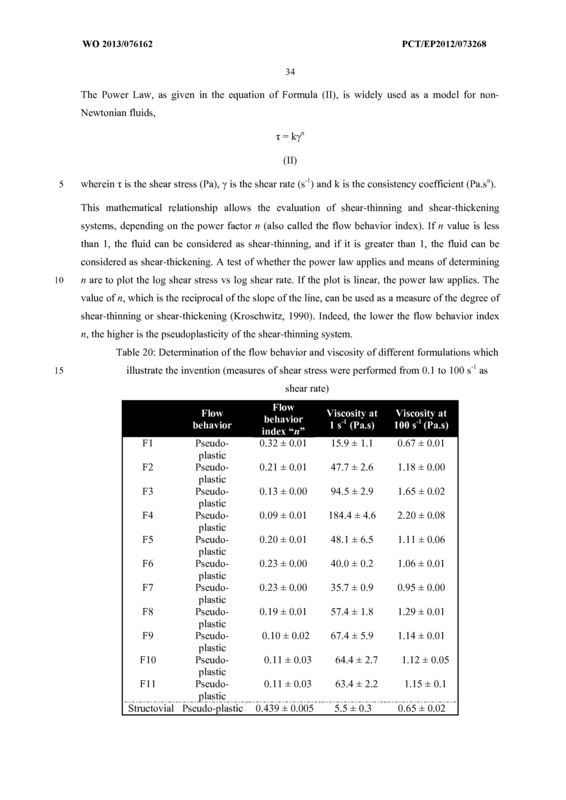 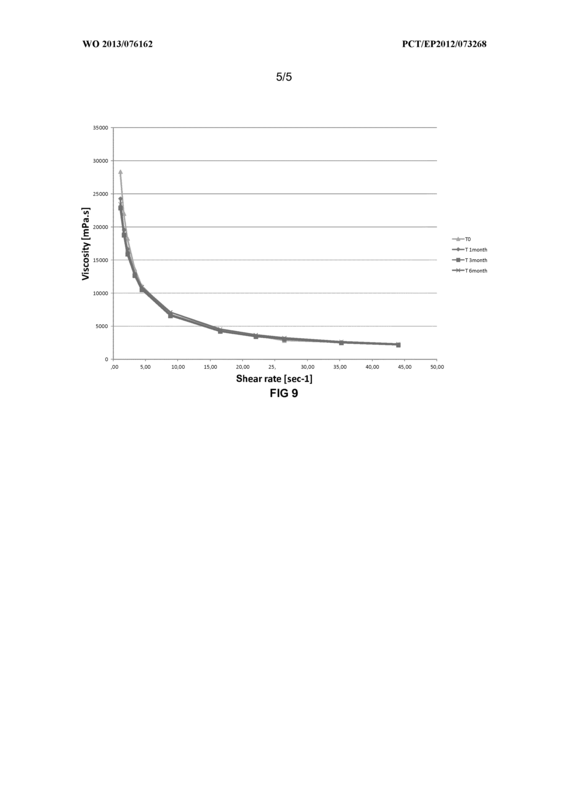 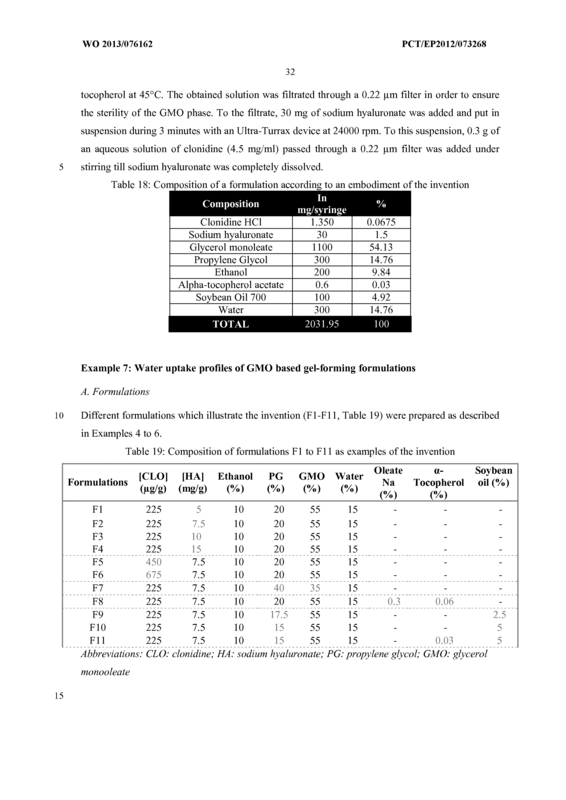 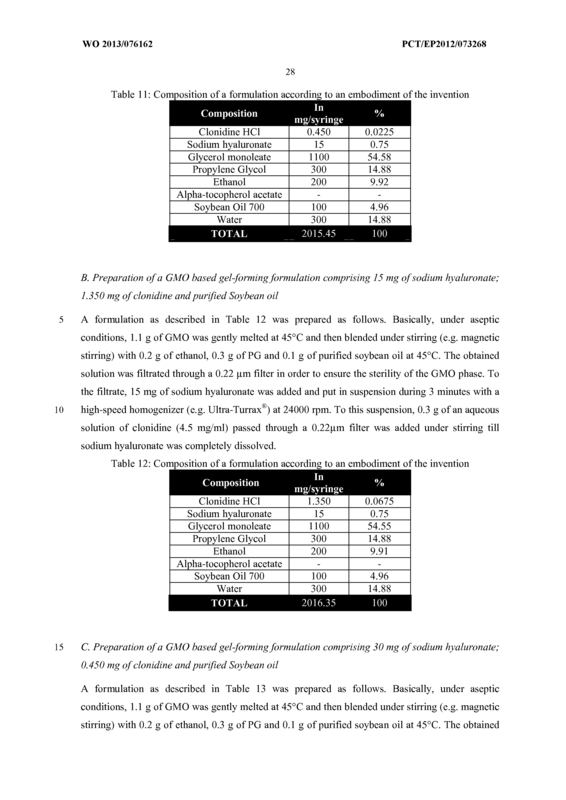 The gel-forming formulation according to any one of claims 1 to 7, having pH ranging from 6.0 to 7.0, preferably pH ranging from 6.2 to 6.8, more preferably pH of 6.5. 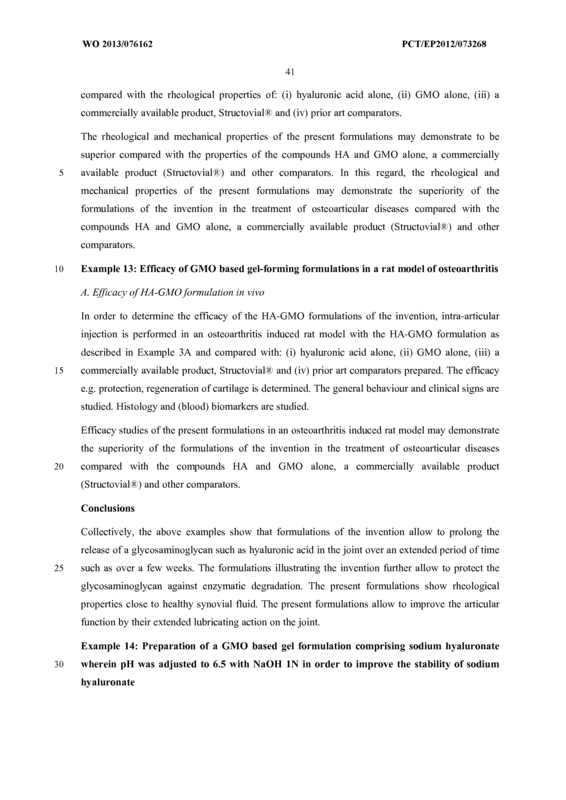 The gel-forming formulation according to any one of claims 1 to 8, further comprising one or more excipients selected from a solvent, an oil and an antioxidant. 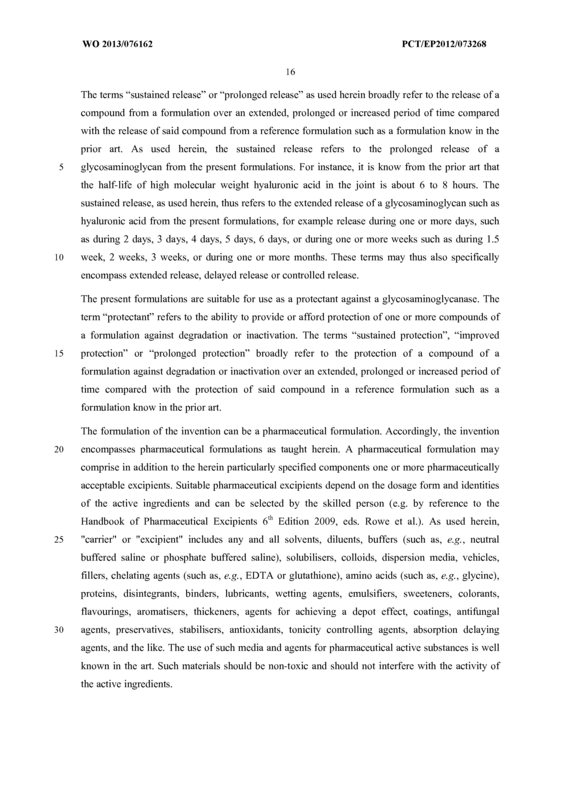 The gel- forming formulation according to any one of claims 1 to 9, further comprising one or more active ingredients. 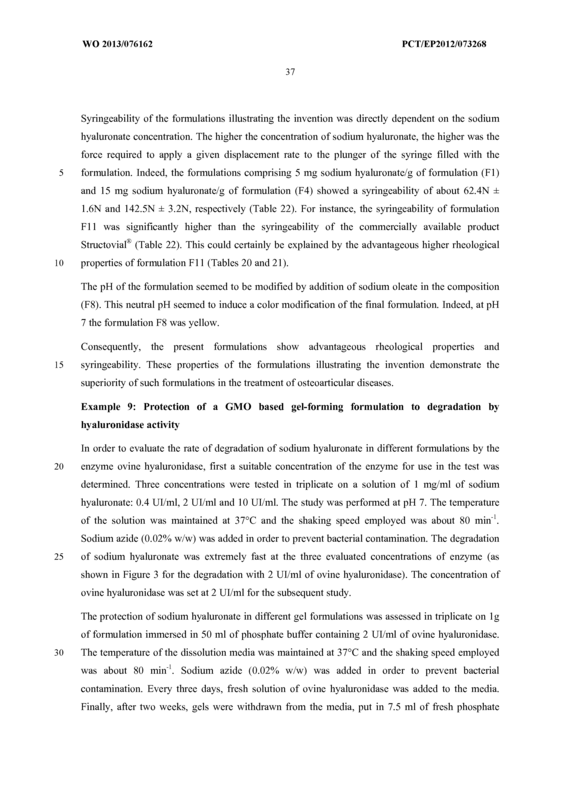 The gel- forming formulation according to any one of claim 1 to 10, wherein the gel-forming formulation is a pharmaceutical formulation. 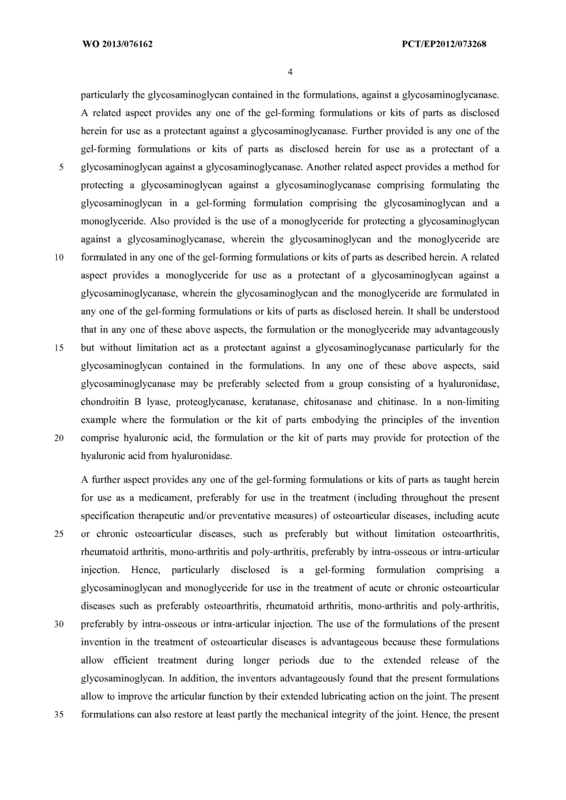 The gel- forming formulation according to any one of claims 1 to 11 for use as a protectant against a glycosaminoglycanase, preferably selected from hyaluronidase, chondroitin B lyase, proteoglycanase, keratanase, chitosanase and chitinase. 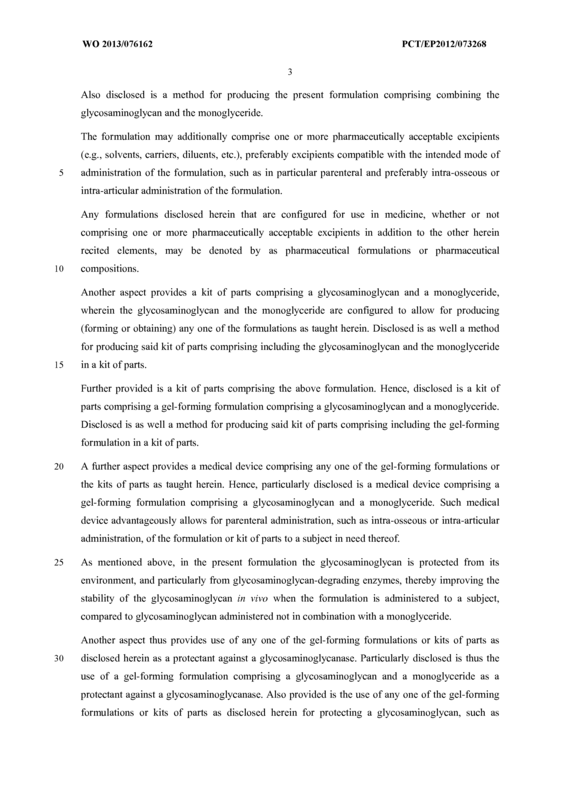 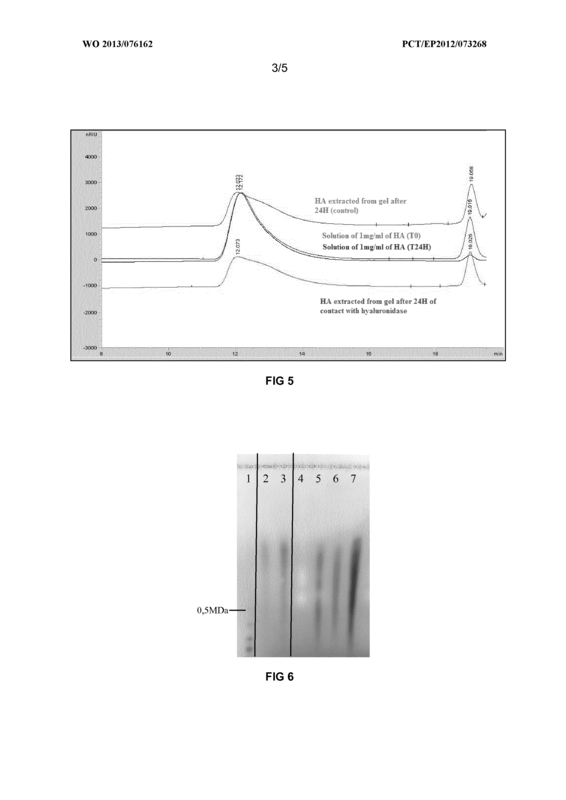 A kit of parts comprising a glycosaminoglycan and a monoglyceride, wherein the glycosaminoglycan and the monoglyceride are configured to allow for producing a gel- forming formulation according to any one of claims 1 to 12. 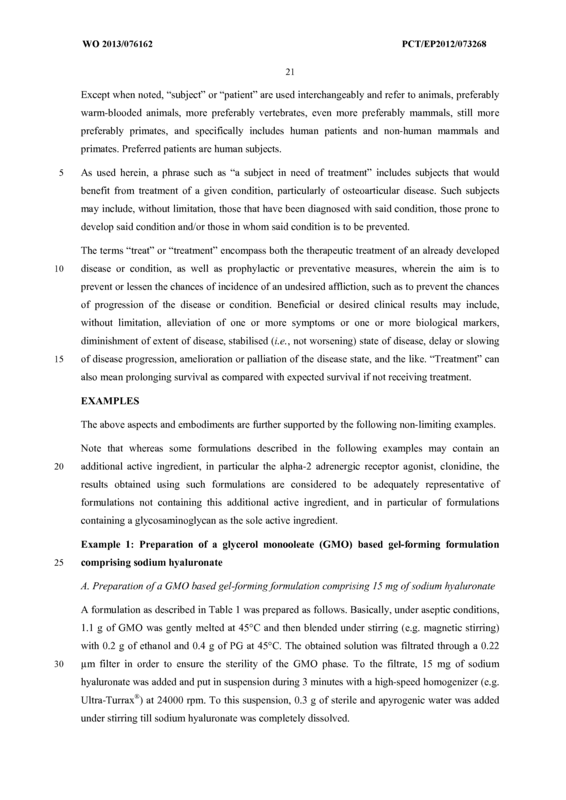 Use of a gel- forming formulation according to any one of claims 1 to 12, or the kit of parts according to claim 13, as a protectant against a glycosaminoglycanase, preferably selected from hyaluronidase, chondroitin B lyase, proteoglycanase, keratanase, chitosanase and chitinase. 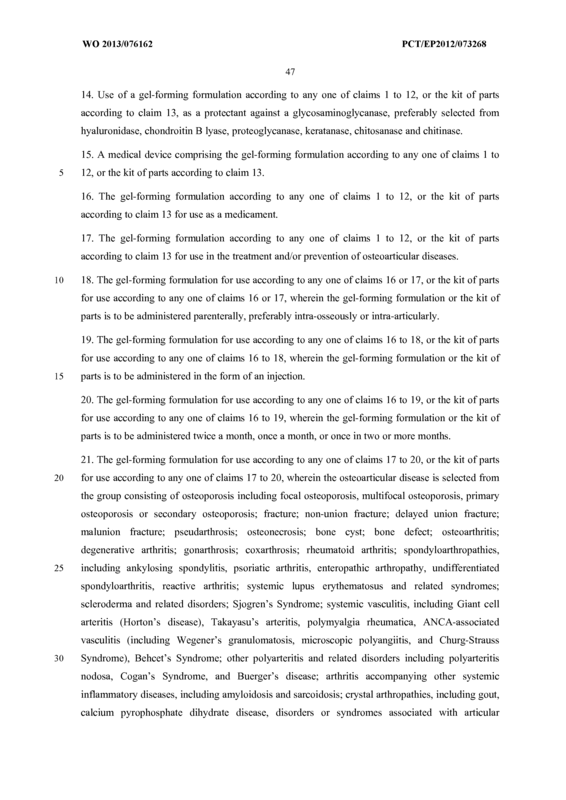 A medical device comprising the gel- forming formulation according to any one of claims 1 to 12, or the kit of parts according to claim 13. 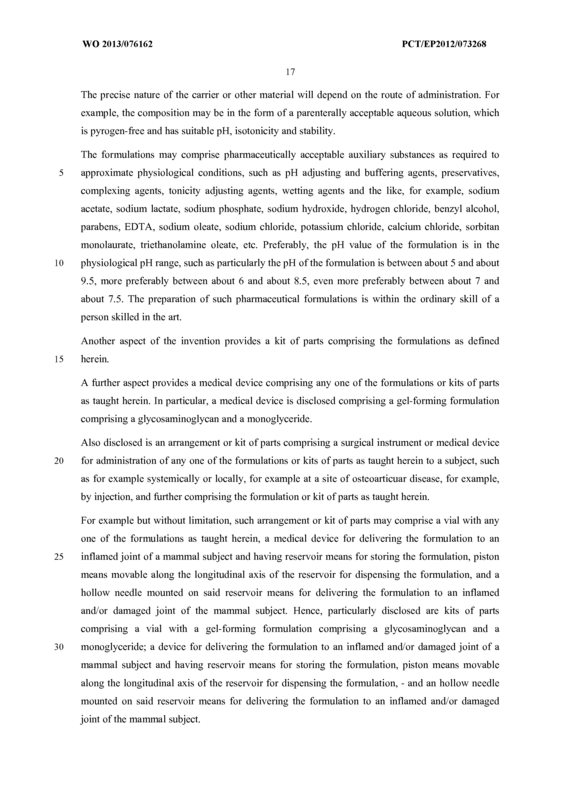 The gel- forming formulation according to any one of claims 1 to 12, or the kit of parts according to claim 13 for use as a medicament. 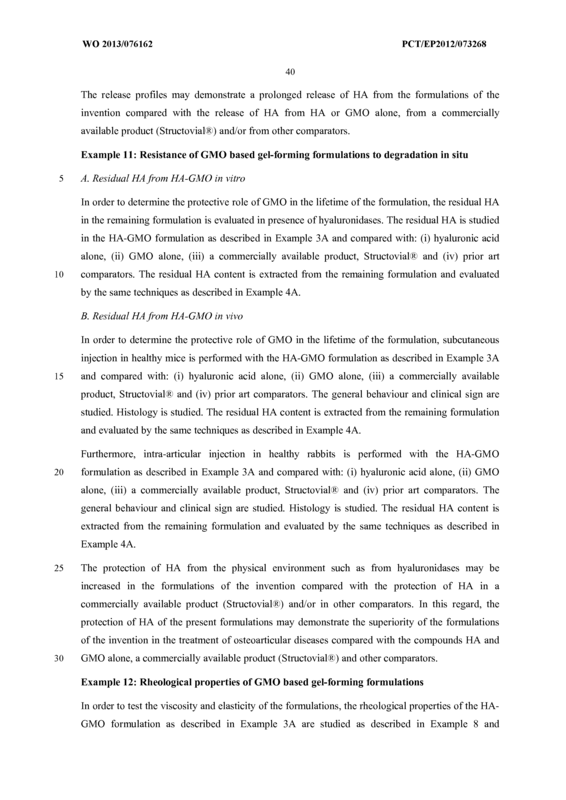 The gel- forming formulation according to any one of claims 1 to 12, or the kit of parts according to claim 13 for use in the treatment and/or prevention of osteoarticular diseases. 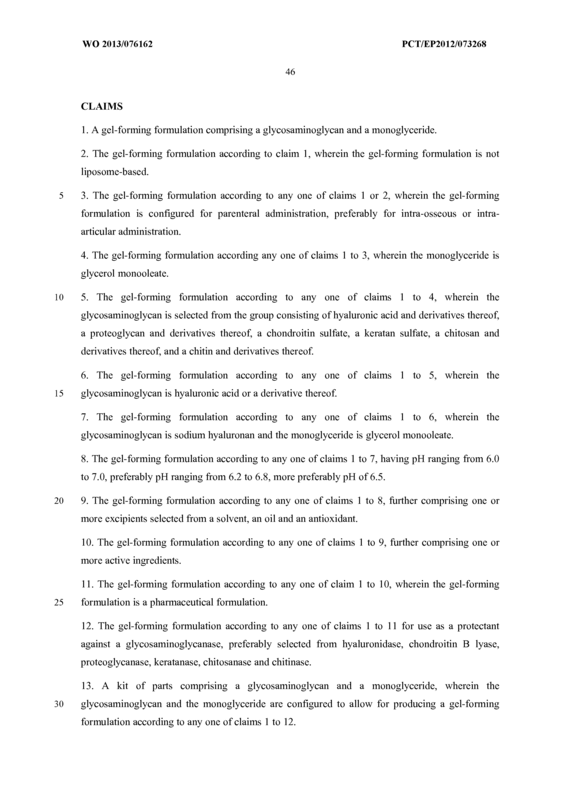 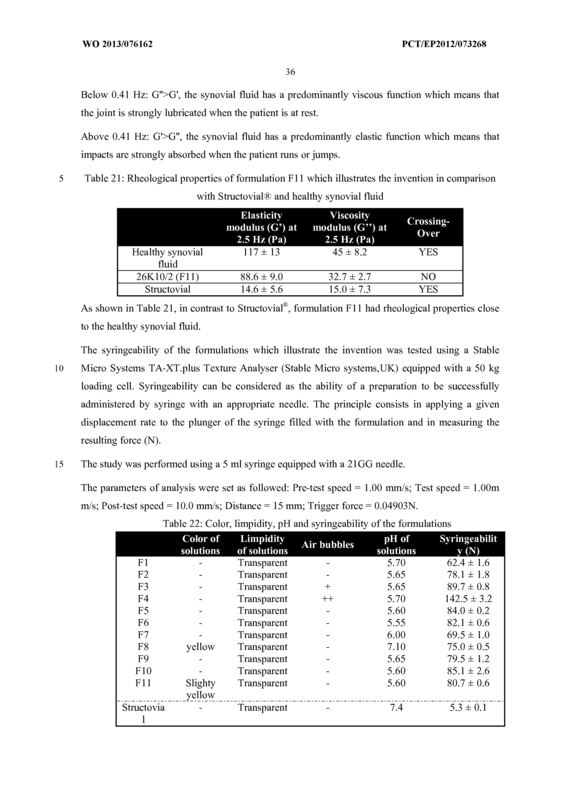 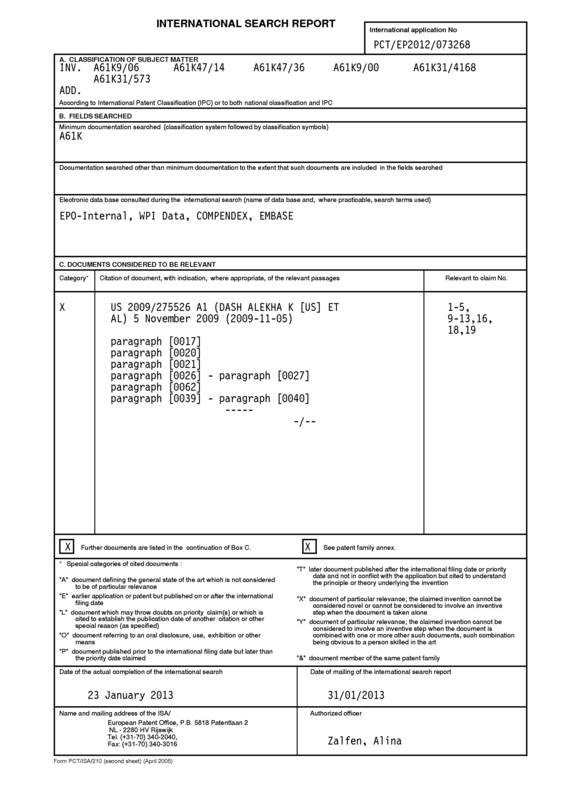 The gel-forming formulation for use according to any one of claims 16 or 17, or the kit of parts for use according to any one of claims 16 or 17, wherein the gel- forming formulation or the kit of parts is to be administered parenterally, preferably intra-osseously or intra-articularly. 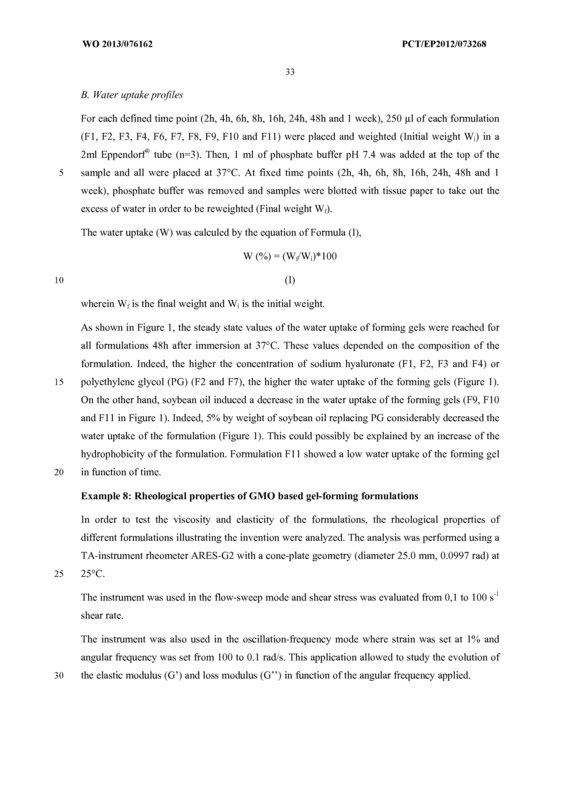 The gel- forming formulation for use according to any one of claims 16 to 18, or the kit of parts for use according to any one of claims 16 to 18, wherein the gel- forming formulation or the kit of parts is to be administered in the form of an injection. 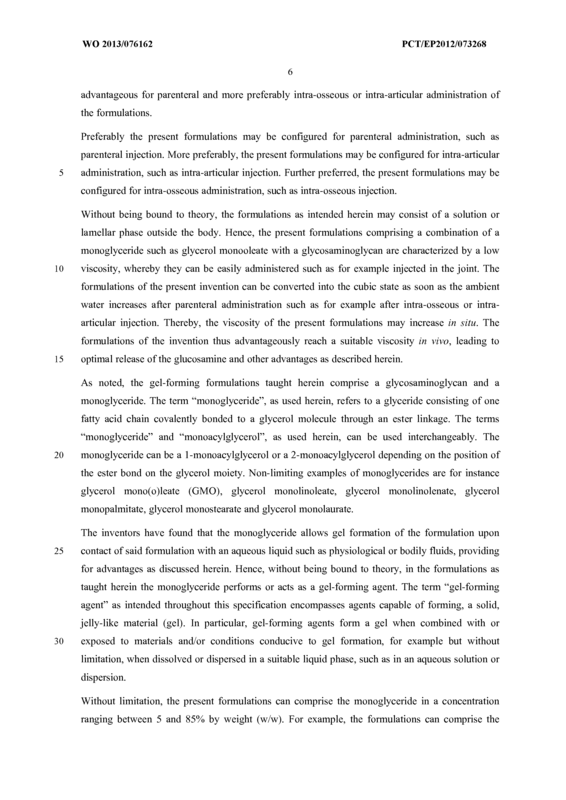 The gel- forming formulation for use according to any one of claims 16 to 19, or the kit of parts for use according to any one of claims 16 to 19, wherein the gel- forming formulation or the kit of parts is to be administered twice a month, once a month, or once in two or more months. 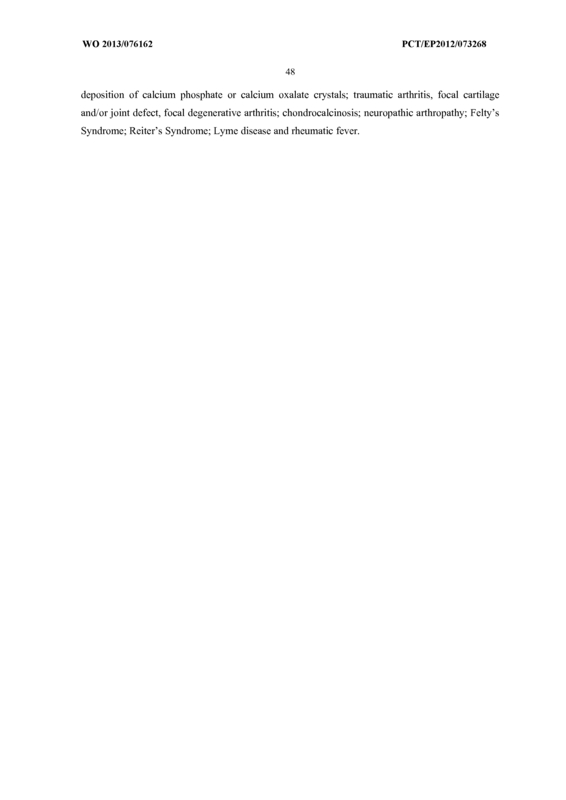 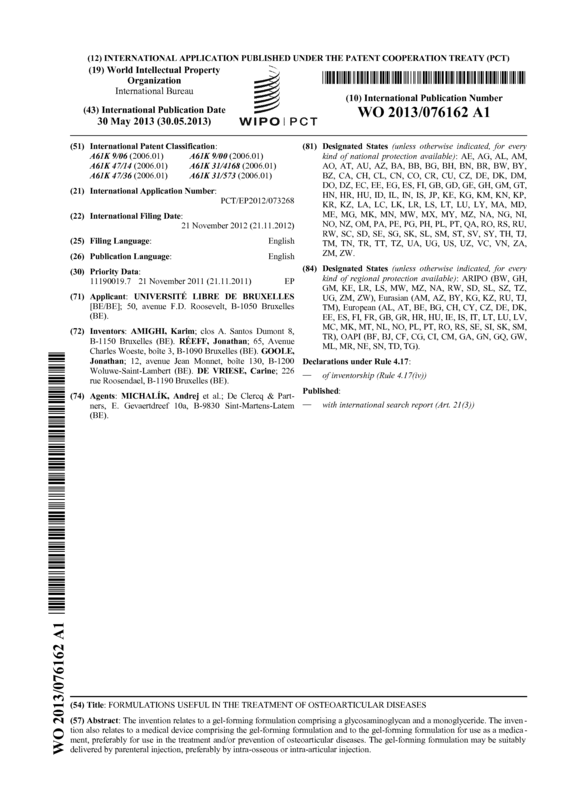 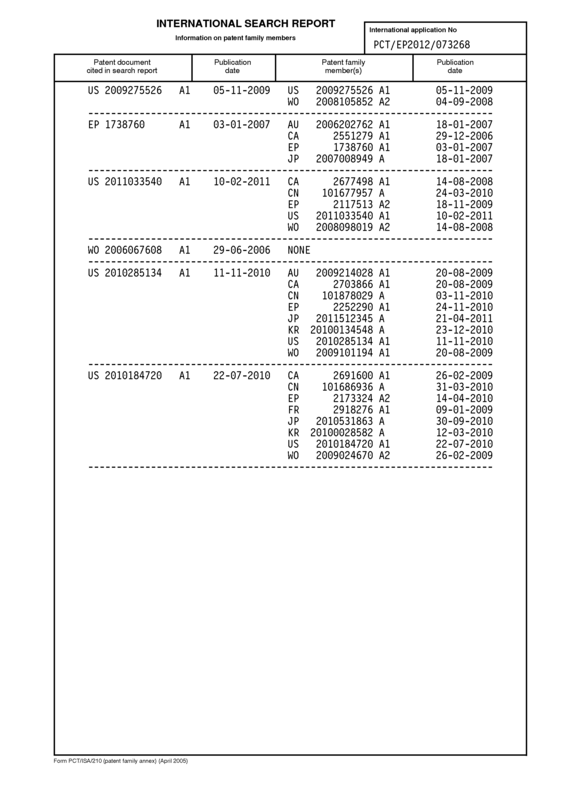 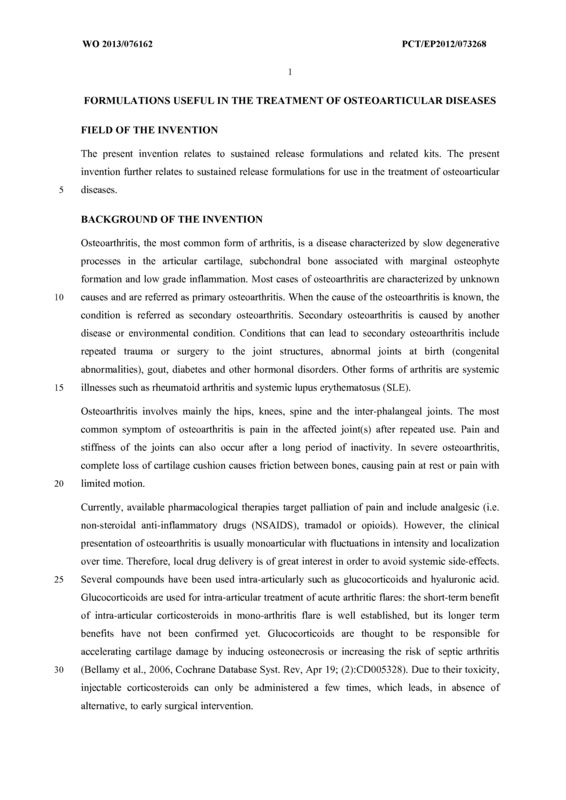 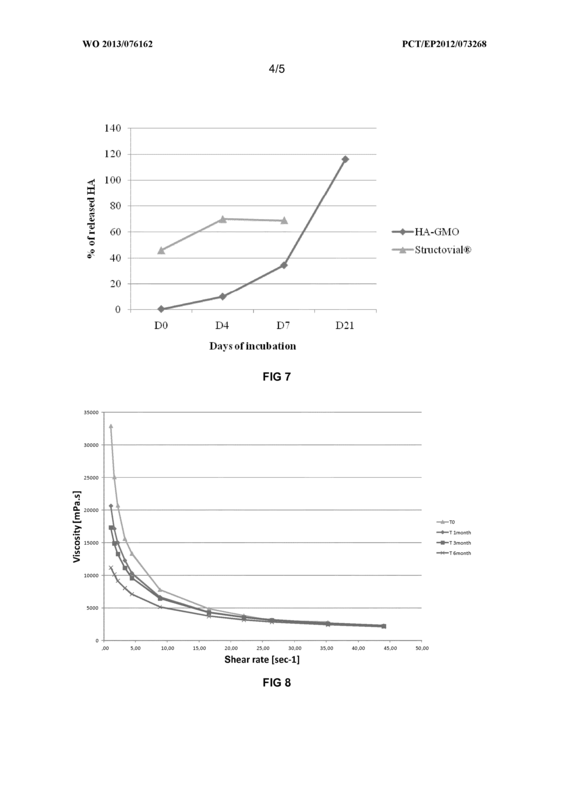 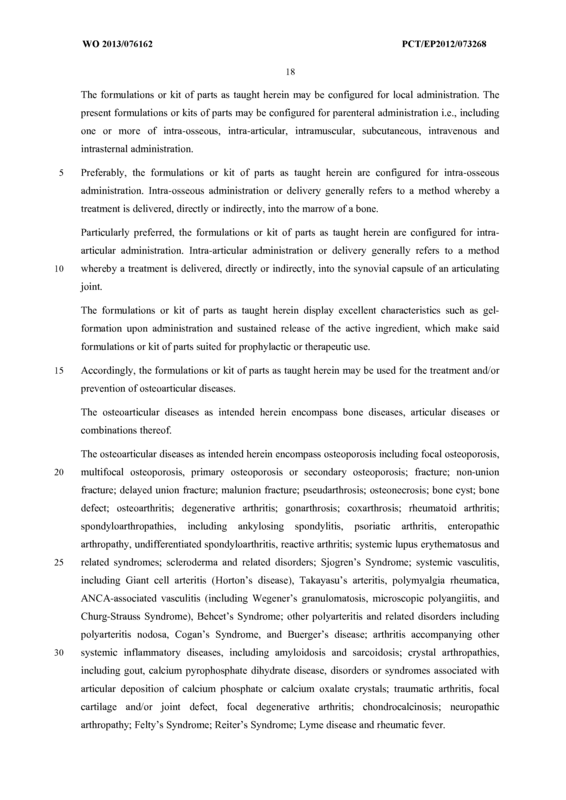 The gel- forming formulation for use according to any one of claims 17 to 20, or the kit of parts for use according to any one of claims 17 to 20, wherein the osteoarticular disease is selected from the group consisting of osteoporosis including focal osteoporosis, multifocal osteoporosis, primary osteoporosis or secondary osteoporosis; fracture; non-union fracture; delayed union fracture; malunion fracture; pseudarthrosis; osteonecrosis; bone cyst; bone defect; osteoarthritis; degenerative arthritis; gonarthrosis; coxarthrosis; rheumatoid arthritis; spondyloarthropathies, including ankylosing spondylitis, psoriatic arthritis, enteropathic arthropathy, undifferentiated spondyloarthritis, reactive arthritis; systemic lupus erythematosus and related syndromes; scleroderma and related disorders; Sjogren's Syndrome; systemic vasculitis, including Giant cell arteritis (Horton's disease), Takayasu's arteritis, polymyalgia rheumatica, ANCA-associated vasculitis (including Wegener's granulomatosis, microscopic polyangiitis, and Churg-Strauss Syndrome), Behcet's Syndrome; other polyarteritis and related disorders including polyarteritis nodosa, Cogan's Syndrome, and Buerger's disease; arthritis accompanying other systemic inflammatory diseases, including amyloidosis and sarcoidosis; crystal arthropathies, including gout, calcium pyrophosphate dihydrate disease, disorders or syndromes associated with articular deposition of calcium phosphate or calcium oxalate crystals; traumatic arthritis, focal cartilage and/or joint defect, focal degenerative arthritis; chondrocalcinosis; neuropathic arthropathy; Felty's Syndrome; Reiter's Syndrome; Lyme disease and rheumatic fever.